This morning I was woken up by the crash of thunder and a flash of lightning. So now it’s hot, humid and stormy. My hair has passed the ungroomed Labradoodle stage and has gone straight to wild, rabid poodle. And I must go out in public. Luckily, I am rewarding myself for being brave enough to show my hair to the world by dining with friends tonight. Irish food too. But, I needed something until then to sweeten my mood and take the focus off of my mane. Just a bite, mind you. Luckily, I had prepared for this emotionally-necessary-food-craving by putting something chilled and creamy in the freezer for my final post of Bite Back Week. Music may soothe the savage beast, but chocolate soothes this mama on a bad hair day. 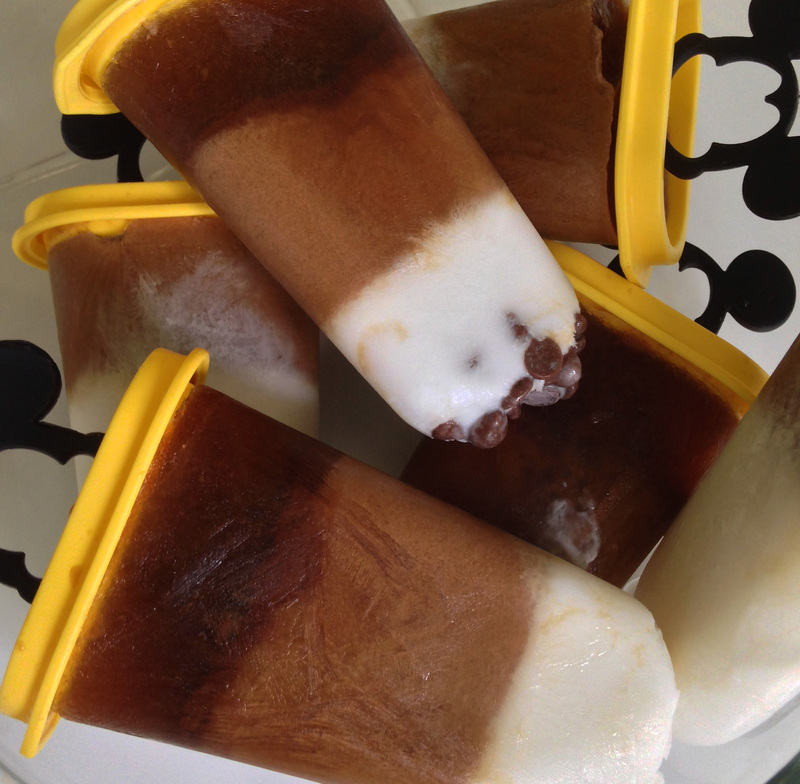 So while fending off Padme with one hand while I tried to take pictures with the other, out came these…..
Cocoa-Mocho-Coco Popsicles. Definitely a grown-up treat. So tasty and so easy. With just a bit of prep work, you can have this for dinner dessert. And they are most definitely worth waiting for! 6 cups of coffee, I used decaf French Roast and this made way more than the 6 popsicles pictured. I may have made granita with the rest……but that’s for another post. Chocolate chips, coconut, ground almonds, whatever you would like to add! 1. Make a pot of coffee, decaf of regular, as strong as humanly possible. I used French Roast and set my coffee maker to “strong”. Resist the urge to drink any. 2.Chill all ingredients, if possible, it will make the freezing process quicker. 3. Empty 1/2 can of the coconut milk (or about 1 cup of any other milk) into a bowl and mix in 2 tbsps. honey and stir like crazy. I used honey because sugar wouldn’t have dissolved and would have been grainy instead of smooth. There is always a method to my madness……set this mix aside. 4. After the coffee has brewed, add in vanilla, sugar, and cocoa powder to the pot and stir to dissolve. It will smell like Starbucks in your kitchen. 5. 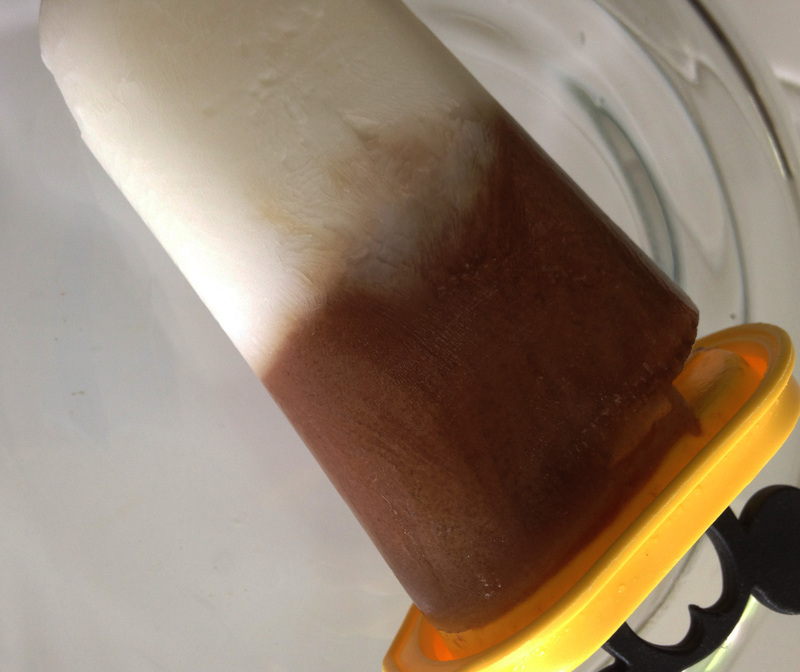 Pour sweetened coconut milk mix into your popsicle molds – I varied the levels so I could make different tastes. A few I filled up halfway for a latte. Add in chocolate chips, etc if desired. Place molds in freezer until solid. 6. Meanwhile, take three cups of your coffee and add the remaining coconut milk to this. Set aside. When the popsicles are solid, carefully ladle some of this mixture on top of the coconut milk. Think of it as on of those 19790’s Jello molds. 7. After the two layers are frozen, you can add in the remaining straight sweetened coffee on top of the other layers, be sure to add the popsicle stick in at this point! 8. Allow to fully freeze and enjoy! If you don’t have popsicle molds – hang in there! Do you have an 8-9 inch cake pan? Pie plate? 1. Place the sweetened coconut milk layer in the pie plate. Freeze until solid. 3. Add the straight, sweetened coffee layer on top of that. Freeze until, you know. 4. When totally frozen, run a moistened, warm dishtowel over the bottom of the pie plate to loosen the “pie”. Turn out onto a plate, and with a knife dipped in warm coffee or water) carve into slices or using a fork, break into chunks and enjoy! So there it is, the end of Bite Back Week. You know have enough meals in your arsenal to have a good breakfast, lunch and dinner with dessert! Stay tuned, another Brainless Monday Meal (TM) is coming!